Not every member of the GI Joe team can be a badasss ninja or top-level superspy, just as not everyone in the real military can be a sniper or a paratrooper. This is a military unit, after all: somebody's got to work in the mess hall, somebody's got to be a switchboard operator, and somebody's got to be the glorified chauffeur. Wild Bill served as combat infantryman and participated in LRRP (Long Range Reconnaissance Patrol) operations during Southeast Asian missions. Reenlisted for Flight Warrant Officer School and has since remained in service. Specialized Training: CLASSIFIED. Qualified Expert: M1191A auto pistol (prefers single action .45 long Colt revolvers), XM-16 attack rifle. Fun fact: the original filecard said he took part in the Southeast Asian "debacle," not "missions": either they're trying to be slightly more politic about how badly we got our asses handed to us in Vietnam, or they're trying to divorce Wild Bill's past from any specific timeframe; probably the latter. After all, these characters were introduced 25 years ago - it's hard to portray them as still being active military personnel. Wild Bill uses the same body seen on Ace, though it's not really fair to call him a repaint: yes, Ace was released first, but the two hit so close together that it's possible the body was made with both of them in mind - or even designed for Bill, and repurposed for Ace. Still, unless you know what you're looking for, you're not going to notice the similarities. 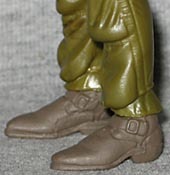 The flight suit is olive drab, and he seems to be wearing slightly darker chaps (which is where the idea that this mold originated with the cowboy came from) and has a new pouch on the back of his belt. 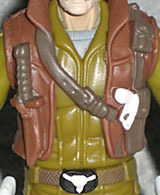 He's wearing a brown vest with a knife sheathed on the right side and a small gun in an old-fashioned holster on the left. Suiting his wild west persona, he's got brown cowboy boots, a longhorn belt buckle and a blue Stetson with a gold cord. With his hat on, Wild Bill doesn't look too bad, but take a closer look or pop it off, and you'll notice his head is too small. Like, ridiculously tiny. The sculpt is nice, with big silver glasses, wavy hair and that thick, bushy mustache. This is definitely the Wild Bill you remember from the comics or cartoon - much better than recent efforts in the SpyTroops or Valor vs. Venom assortments - he's just got a wee little head. Of course, the vest making his chest more bulky just adds to this effect. 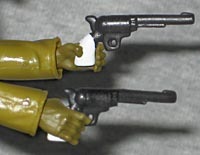 Besides the removable hat and vest, Bill's only accessories are his twin revolvers. They're black with white grips, and fit in his holsters nicely. On the original figure, the guns were just sculpted onto his legs, so separate accessories are a step up. Plus, the sculpted guns were backwards: to draw them, he'd have to reach across his body in both directions and draw from down near his knees. I don't care how fast you are, you try to slap leather like that, you're going to get shot. Sadly, just like Ace and Wild Weasel, Wild Bill is missing his most important accessory: his ride. The guy is the team's helicopter pilot, so without a bird to fly, what's he doing here? I'm sure he's good in a scrap, but the guy needs his Dragonfly to really be complete.